One of the more interesting requests I receive at my library’s reference desk comes from parents seeking math books for their kids. Generally speaking, they don’t want math textbooks or worksheets of math problems. No, they want books in a picture book format that incorporate math in some original manner. Now it is fortunate that there are a slew of such books out there. You can find them in any good children’s library if you know where to look and with the right teacher or parent, such books can make concepts like fractions or division or subtraction make perfect sense. Fibonacci numbers are a little trickier. Unlike addition or multiplication they are difficult to show to kids as having practical applications in real life. You could discuss how Fibonacci numbers apply to music, but that’s still tricky territory. Nature, however, is a natural complement. Kids understand flowers. Kids can understand duplicating numbers. Put the two together and you’ve the newest picture book format math book to add to your shelves. It does contain a couple difficult concepts, but with the right grown-up by their side, there’s very little in Growing Patterns: Fibonacci Numbers in Nature that a child won’t be able to figure out on their own. Take a look at these flowers and count the petals you see. One. Two. Three. Five. Eight. Notice anything? These petal numbers add on to one another. One plus two equals three. Two plus three equals five. These numbers are called Fibonacci numbers, and what’s crazy is that as they go they keep showing up in nature and it’s not just in flowers either. If you count spirals on pinecones or sunflowers or pineapples, no matter how you look at them they equal one of these numbers. With brilliant bright photography and simple words, Sarah and Richard Campbell make a math concept understandable. A section on “More About Fibonacci Numbers” and a Glossary of terms appear at the end. It may sound as if this is a fairly simple and straightforward concept, but how do you write an entire book about duplicating numbers found in nature for youngsters? The Campbells have opted for starting out easy and getting slowly more complicated as the book goes on. So at the start the child reader is handed a really easy idea. They look at pictures and count the petals. By the time they get to the eight petals on the cosmos they learn about doubling the numbers and we see the same flowers all over again. Then the numbers get higher. The ideas get harder. It’s clear that some adult help may be needed to explain along the way. I suppose the real question here is whether or not kids are gonna get all the concepts the book is throwing out. At the start it’s pretty clear but when it starts getting into counting the number of spirals, that’s when things begin to get wonky. You have to realize that spirals on pinecones and sunflowers and pineapples can go a variety of different ways. What would be fun is if grown-ups turn it into a game. What if you bought a pineapple and had the kids identify the spirals and then count them? That’s pretty cool. Of course then you start getting into the golden spiral concept and that gets kind of complicated. And, of course, if your child attempts to understand The Golden Ratio explanation at the end of the title, sign that kid up for instant math lessons pronto. It makes sense if a grown-up breaks it down, but otherwise this might be information best gleaned by the math-hungry. A six-year-old will be out to sea, but I’d bet there are 10-year-old math whizzes out there that’d get it in a heartbeat. I found myself wishing that the book explained more about the concept of that aforementioned golden spiral, though. In the book you are given a vision of boxes representing the Fibonacci numbers laid out together in a specific pattern. Why they are placed in this pattern is unclear, though, which makes the fact that a single spiral connects them seem a little haphazard. Of course I know that I can’t have it both ways, saying the book is too complicated sometimes and then complaining that other sections don’t explain enough. Just the same, a sentence or two to explain why these boxes were in this pattern (are they double the size of one another and the only way they fit together is in a rectangle?) would not have been out of place. I did appreciate that the book makes an effort to be a little subtler than a Fibonacci book for children in the past might have been. In the old days a non-fiction title for kids would be more than happy to merrily proclaim that Fibonacci was an Italian fellow who discovered these numbers and published a book on them in 1202, end of story. Ms. Campbell, however, mentions more than once that before Fibonacci was strutting about, these numbers were known in India by a variety of scholars (and she even names them by name). There’s also a note at the end of the book that says, “Not all numbers in nature are Fibonacci numbers. A dogwood has 4 petals, and an amaryllis has 6.” You’d be forgiven if your natural reaction to this was an outraged, “So what’s the point then?” Fortunately, if you read the extra text in the back there’s an actual little section there called “Why Fibonacci Numbers?” that says that these numbers show up 90 percent of the time in plants with multiple parts around a single stem. It’s not perfect, but it’s there. There is no non-fiction subject so interesting that full-color photographs taken post-1990 cannot improve. Would Nic Bishop be the star he is today if he didn’t have the power of his lens to work with? The Campbells gave Bishop a run for his money a couple of years ago when they photographed one of the world’s more slimy denizens in Wolfsnail: A Backyard Predator. The obvious difference here is that while most of these photographs are taken in nature, just as Wolfsnail was, others have been doctored for teaching purposes. The most obvious example is a two-page spread that shows the same pinecone three times but with different digitally darkened spirals in two of the shots. It’s a good thing the text says that “All the pictures on these two pages show the same pinecone” because otherwise it would ruin the whole purpose of the shots. Of course all the photos are lovely, but it’s nice to also see that they serve to drill home certain points. There’s a simply lovely book out this year for the 9-12 year old crowd called Sugar and Ice by Kate Messner that touches upon this very subject. In that book the heroine decides to do a school project on Fibonacci numbers in nature. Would that she had Growing Patterns to help her along. After all, this book lays down the law of Fibonacci in a fun and informative way. Consider pairing it alongside Joseph D’Agnese’s Blockhead: The Life of Fibonacci for a full Fibonacci-inspired unit. It’s math made interesting. Creativity wins the day once again. Sarah was interviewed on Mississippi Public Radio. Sarah interviewed during a blog book tour at Dori Reads, Writing Snacks, Teaching Authors, Joseph D’Agnese’s Blog, Live. Love. Explore., Elizabeth O. Dulemba’s Blog, and My Log Cabin Life. Finally, Sarah was interviewed at Writing Snacks. Here’s a handy website for the book including this nice section for teachers. She also runs a blog. 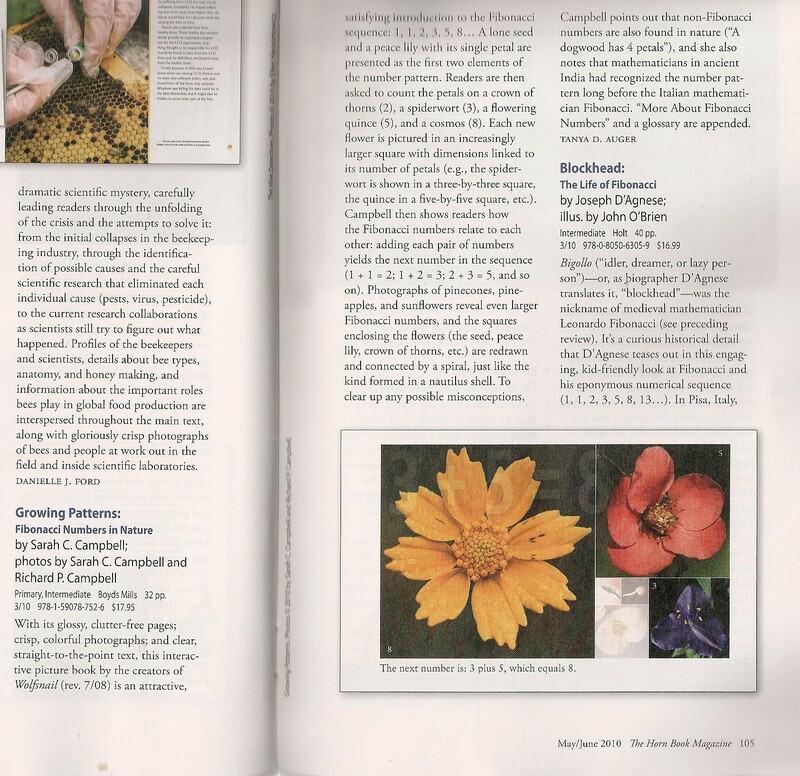 Amusingly, Ms. Campbell decided to interview fellow 2010 Fibonacci-related author Joseph D’Agnese on her blog. He did the same, interviewing her here and here. Like Fibonacci but want to see it done in new formats? Have you considered poetry? And while you’re at it, meet its creator. Always nice when a book has a good trailer to go with it. This one’s a lot of fun. Pretty darn professional too. This one’s a fun talk with Ms. Campbell about what kids mistakenly think the book is about, as well as the fact that the cover image is seven pictures merged into one. And now Richard gives a little more in-depth insight into the process that created the cover. Thanks Betsy. As usual, your review is chock full of great extras that I am going to bookmark. I picked this little baby up for my middle school library. The seventh grade math and art teachers collaborate on a Fibonacci project. I also find it funny how many coincidences happen in my reading. I was lucky to read Sugar and Ice as well! I love how Kate Messner weaves instructional units so naturally into her stories. Last year it was Norse mythology – Gaiman’s Odd and the Frost Giant, Libba Bray’s Going Bovine and Eoin Colfer’s sequel to Douglas Adams’ Hitchhiker’s Guide series, And Another Thing. After reading all three of these within a month of each other, I had an itch to delve into Norse mythology. Fibonacci numbers are also VERY useful in math. My husband is a graduate student and is amazed how often the Fibonacci system seems to come up as answers to problems!